You may not have even known there was sugar in your Bacon, but Applegate has gone ahead and removed the ingredient for you. 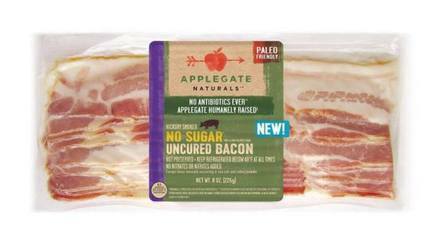 Applegate, a leader in natural and organic meats, launched its first sugar-free Bacon product last week. The company, owned by Austin-based Hormel Foods Corp., prides itself on making "worry free" meats, and its new Applegate Naturals No Sugar Bacon allay one more concern for ingredient-conscious consumers. "With a growing demand for sugar-free options, we're excited to deliver a Bacon that supports the needs of those looking to reduce their sugar intake, while upholding Applegate values-making products with humanely raised meats and simple ingredients," said Nicole Glenn, Applegate's vice president of marketing, in a release.